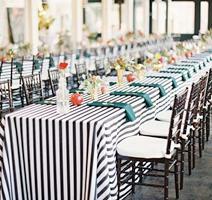 Our Venue Reporters love a good Hotel-as-Home venue. 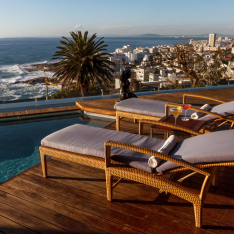 When we spoke with Anna about The Ellerman House and she sent us the information about the venue, we may have immediately looked up flights to South Africa. 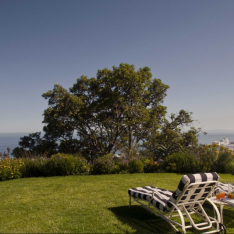 We at The Venue Report love nothing more than a sprawling pedicured lawn overlooking the ocean. 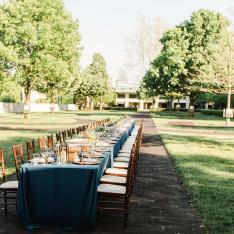 The combo of grassy green meets sparkling sea is pretty darn ideal for celebrations. 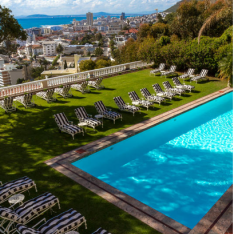 On top of this magic, the fine folks at Ellerman House just HAD to throw in the black and white striped lounge chairs.. Again, a fave combo. We are officially razzled and dazzled. 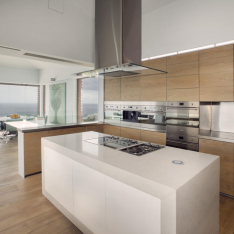 Located in Bantry Bay, Cape Town. 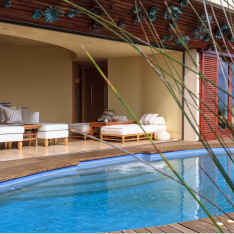 The philosophy of Ellerman House is to share the best of South African culture with its guests through art, wine, dining, and gracious hospitality. 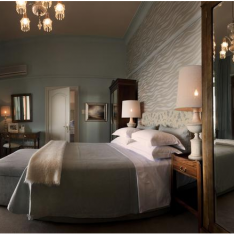 The hotel has South African works of art dating from the 1800s to works from today’s rising artists housed in a separate Contemporary Gallery. 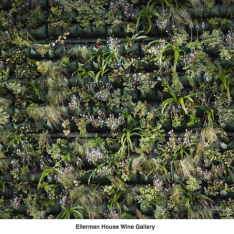 Ellerman House also has launched their Wine Gallery to showcase their ,500-bottle collection of South African Wines. 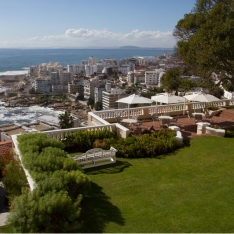 HISTORY LESSON: Once the stately home of Sir John and Lady Ellerman, distinguished shipping magnates and investors, Ellerman House sits perched on the slopes of Lion’s Head. 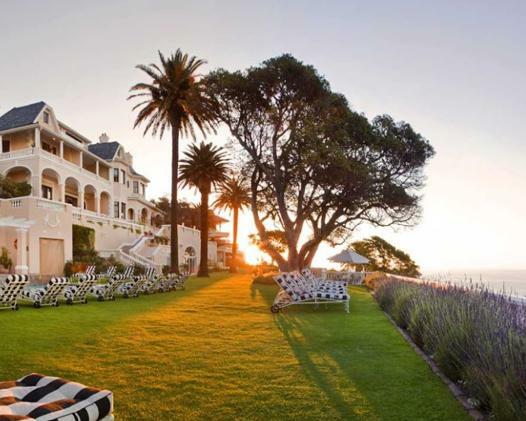 The elegant Cape Edwardian mansion is known for having one of the most spectacular ocean views in South Africa. 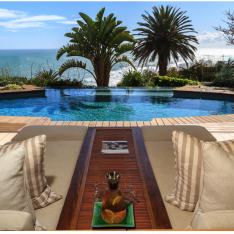 Just ten minutes from the heart of Cape Town, the one-and-a-half acre property features a panorama of Atlantic coastline that includes the infamous Robben Island. HOW WILL MY GUESTS GET HERE? 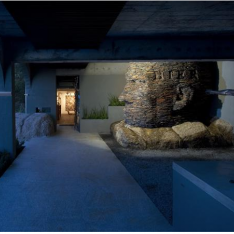 : Easiest way is to fly into Cape Town International Airport; from there it is an easy 25-minute drive to Ellerman House. 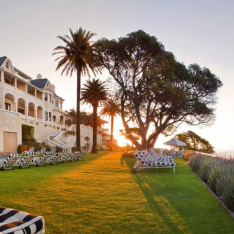 This historic Cape Edwardian mansion venue boasts incredible views of the Atlantic Ocean, Cape Town coastline, Robben Island, and views of the gardens at Ellerman House. 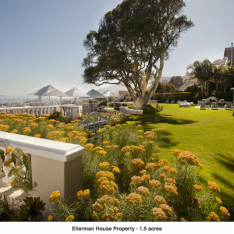 Ellerman House is best suited to intimate weddings and events with 50 guests or less, and will be a memorable venue for couples who are particularly passionate about art and/or wine. 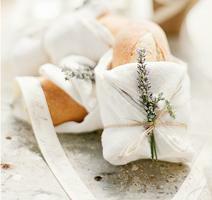 So foodies rejoice! Your guests will be served the most deliciously divine meals created by reknowned international chefs are displayed to perfection on china, silver and crystal. 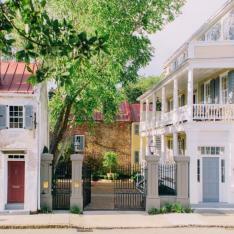 With shaded verandas, tiered gardens, beautiful interiors, and a celebrated art collection, your guests will be wowed. 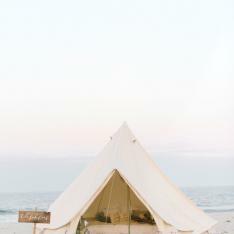 Your guests can rest their heads in one of the eleven rooms, two suites, or private villa. The venue is home to two lounges, a library, two dining rooms, a spa, a main pool, gym, and whisky bar (let's hear it for the boys!). 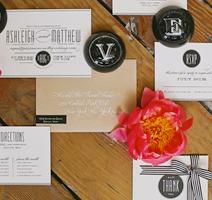 Want privacy on your momentous occasion? 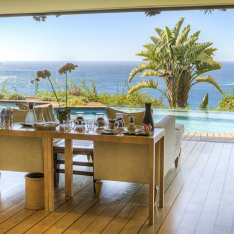 The Ellerman House is not open to the public, offering a genuine level of privacy to guests. 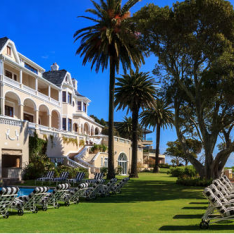 Ellerman House is one of two Relais and Chateaux hotels in the Cape Town area and one of a mere 14 purple shield hotels worldwide! You and your guests can sip wine and cocktails on the terrace of the house that has sweeping panoramic views of the coastline and incredible sunsets. There are generous in-room goodies like a full bar (nothing “mini” about it) and drawers full of locally made snacks such as cookies, chocolates, and biscuits. Want to be mobile? 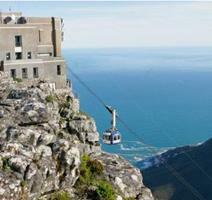 The house car can take you anywhere within a 10km radius in Cape Town, included. 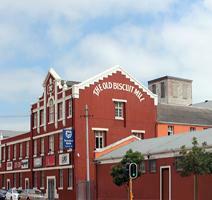 Near the action on the V&A Waterfront but close to Table Mountain and the beaches at Camp’s Bay/Clifton. 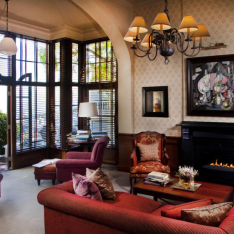 If you’re an artist, get inspired by booking one of the Ellerman House suites; Lady Esther used the suites as her personal art studio for the lighting. 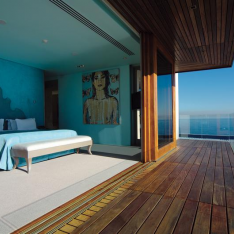 But inspiration is everywhere at Ellerman House; soak it in with a glass of South African wine while sitting in their ocean-facing Contemporary Gallery. Bartenders at Ellerman House make the most innovative cocktails. 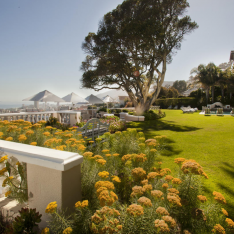 Ask about a unique creation for your special day—nothing is impossible for the Ellerman House team. 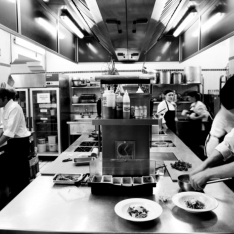 Head to the kitchen downstairs (no space is “off limits” to guests) and have a chat with the cook about what’s on the menu for the day. Hotel-as-Home intimate feel for you and your guests. 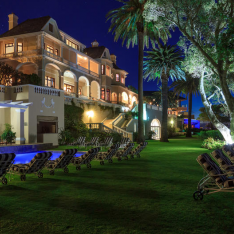 The history - a party at a historic Cape Edwardian Mansion? Yes please! 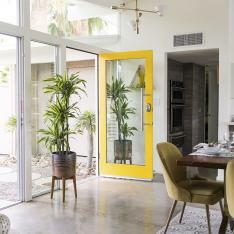 Privacy for you and your guests! Outside visitors are not allowed onsite so your celebration is yours and yours alone. 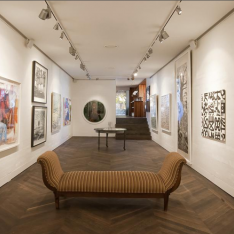 A one-of-a-kind art and wine collection specially curated for the house. Picnic atop Table Mountain, one of the seven natural wonders of the world (photo via tablemountain.net). Many famous names have taken the ride, including Oprah Winfrey, Sting, Arnold Schwarzenegger, Margaret Thatcher, Prince Andrew, Brooke Shields, Michael Buble, Tina Turner, Jackie Chan, and many more! This restaurant off of 2 Deerpark Drive West in Cape Town is a must for both vegetarians and meat eaters. 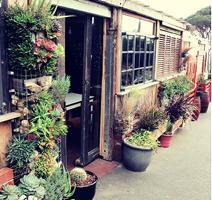 The outside looks like a succulent garden and the inside is adorned with vintage lamp shades and long wood dining tables. 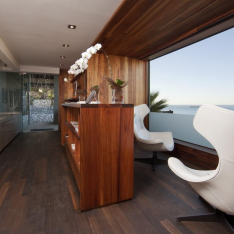 All images Courtesy of Ellerman House.